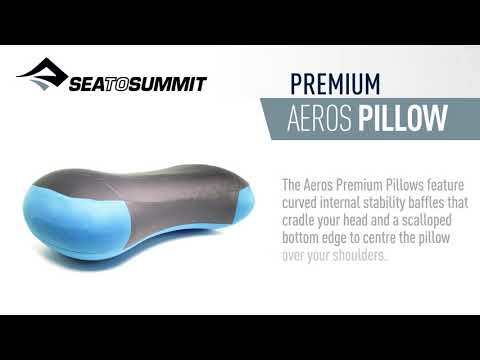 Following the huge success of the Aeros Premium and the Aeros Ultralight pillows, Sea to Summit now delivers a full-size version: the Aeros Deluxe Pillow. The Deluxe range uses a variation of our patented Air Sprung Cells™, allowing the creation of a larger air pillow that doesn’t feel like a balloon under your head. The Aeros Deluxe Pillow is a full 8 inches longer and 4 inches wider than our large size Aeros Premium and Aeros Ultralight pillow. With lightweight fabrics and advanced manufacturing techniques, Sea to Summit® have kept the weight and the packed size very reasonable. So, you now have the option of a truly luxurious pillow for your backcountry bed. Perfect for all travellers or campers, the Aeros Pillow features brushed polyester knit for increased comfort and durability! The Aeros is easily inflated, thanks to the multi-functional valve. Also featuring the Sea To Summit multi-functional, high flow rate valve for easy inflation, deflation and fine tuning of the mat pressure. This one-way reversible valve also enables the use of Sea To Summit® Jetstream or Airstream pumps for easy inflation of your pillow. The valve can be flipped over to allow full compression when rolling up or can be removed to allow a pump nozzle to be inserted.